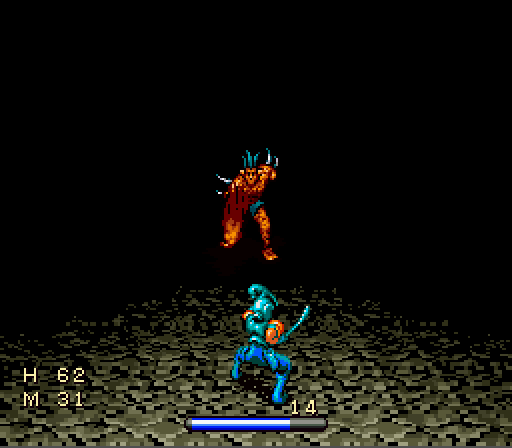 “The 7th Saga”, released by Enix for the SNES is one of my all time favorite games! 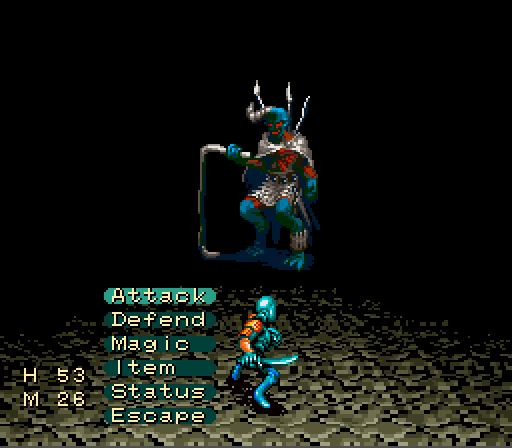 Every time I run into someone else who’s played it, they get this wistful look in their eye, fondness tinged with madness at the game’s occasional (read: near-constant) difficulty and level grinding. Unless, of course, they loathe it for the exact same reasons. This can be one of those ‘Love it or Hate it’ kind of games. 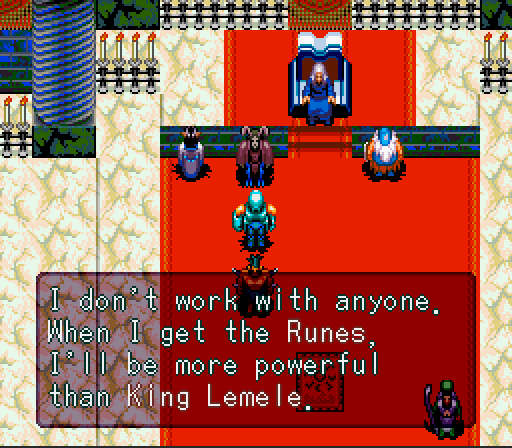 At it’s base, it is a fairly traditional turn-based RPG where you start your journey as one of the 7 apprentices of King Lemele, sent out into the world to recover the 7 Runes of Power. 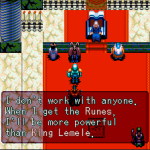 Whosoever completes this quest shall succeed Lemele and become King (or Queen). This all sounds pretty stock, but there is some pretty heavy-duty twisting towards the end. 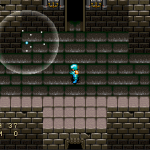 Each character travels along the same basic path (with one or two exceptions), but will interact with the other apprentices throughout the game. 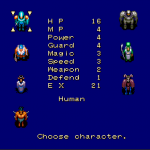 Some compete with you to gather the Runes first, some want to team up with you (with a bit of care, you can form a party with any 2 of the apprentices, despite what the manual says! 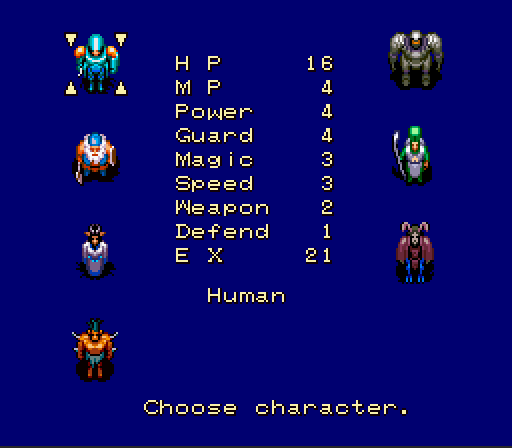 ), and some just be general punks and try to fight you and take your Runes. 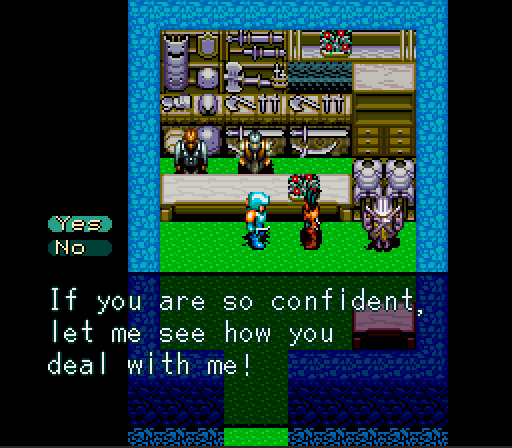 Their attitudes change throughout the game and you should always save before talking to any of the other apprentices. 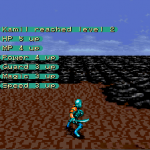 When you have to fight other apprentices, these can be some of the most challenging fights in the game, especially later on, because while they level up with you, they also gain stats faster than you! At very high levels, some apprentices can be nearly (or literally) unbeatable, but you shouldn’t have to deal with them anymore that late in the game. 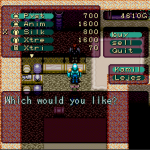 Kamil: A Human warrior that tries to be a jack of all trades. A competent fighter with average stats that can equip most gear and use some healing and fire magics fairly well. Olvan: A Dwarven warrior similar to Kamil, but is a little slower, a little better in combat, and a little less competent with magic. Valsu: A Human Cleric, he is very fast and has access to all of the best healing and support magics. He can deal a little bit of physical damage, and his only attack spell is a basic Ice spell, but it somehow works fairly well for him. Lejes: A Demon War Mage, he has all of the strongest Fire and Ice attack magics and can also deal respectable physical damage, as well as weakening opponents. 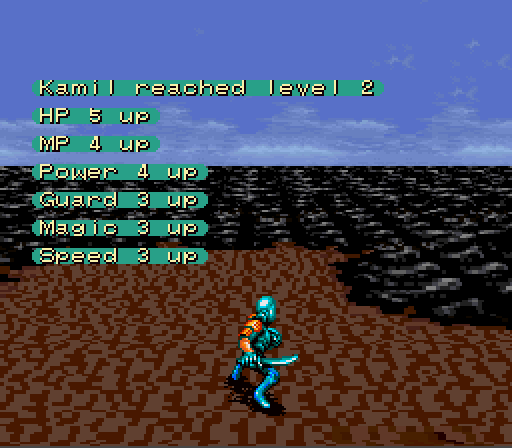 His stats are fairly similar to Kamil’s, but he has pretty light defenses, making him something of a glass cannon. Esuna: An Elven Wizardess, she is the only female of the bunch. She is very fast and has a good spread of magic. Her healing is second only to Valsu, and while having fewer attacks spells than Lejes (focusing only on Ice), she is generally better with them because of her better magic stats. Wilme: An Alien Fighter, he doesn’t use (hardly) any equipment, but is incredibly strong and fast, making him a powerhouse with his physical attacks. He has very weak magic however. Lux: A Robot Warrior (a “Tetujin”), he is similar to Wilme, but is slower, can use some equipment way later on, and has better magic including unique Laser and Thunder spells no one else can use. 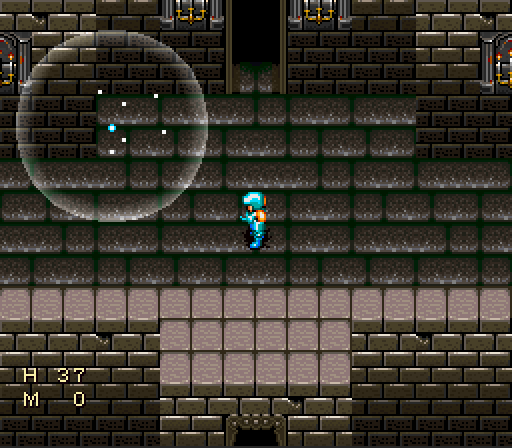 Through most of the game, you can go it alone, and you’ll level faster for it, but it can be rough going at times. Eventually, at a certain point, you’ll REALLY want to team up, but I’d rather not spoil the surprise! Just be sure to keep a backup save before anything that looks like it might be the end of the game! 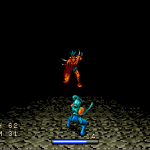 Battles consist of your 1-2 characters facing off against 1-3 enemies at a time. 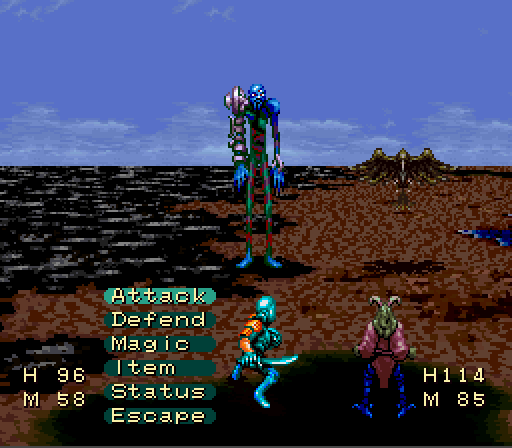 What’s unique about the battle system is that when you enter battle, you spin down to a 3rd person, Mode 7 battlefield, something I’m not sure any other SNES RPG ever did! For the time, it was rather cool and unusual! The battles can get pretty hard at times though. At first, things seem to go alright, but if you go to new places a little too early, enemies can really pummel you, so you need to be careful when exploring newer regions. 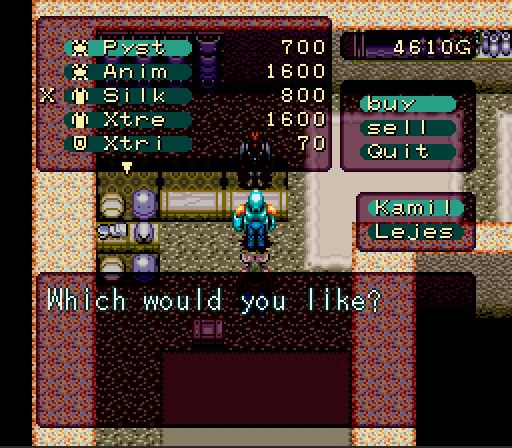 You also need to save up money for the best gear you can buy in an area (unless you’re playing as Wilme or Lux), so there’s a little bit of grinding as you go along throughout the entire game. In the Japanese version, characters gained stats faster (hence why rival apprentices get stronger than you, they missed that part during porting! ), making things go a little smoother. There are ROM hacks out there to restore this, but to a lot of people who’ve played (and liked) the US version, including me, the difficulty is part of the charm. I’ve never played it, but I hear the Japanese version is almost TOO easy. 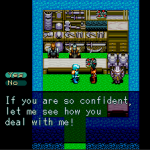 All in all, a very unique and challenging game for people who wish Dragon Warrior was much more complex, difficult, and better looking! Sign me up! 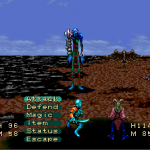 If you like your first playthrough, this game has quite good re-playability since the characters are so different, many different teams will provide a new set of challenges and strategies.